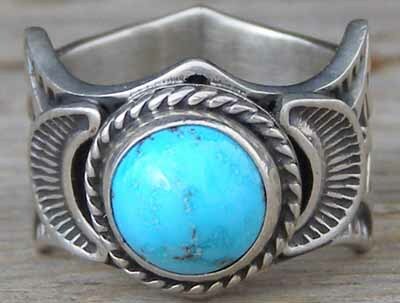 This is a Sunshine Reeves 14-gauge Sterling, single-piece, sculpted shank ring. The stone is set in a straight-edged bezel wrapped with twist wire which forms the border of the ring face. The stampwork bites deep into the silver and no two of these are stamped exactly alike. This is natural, untreated turquoise cut in Persia in classic high-domed style. This turquoise was imported to the United States in the mid-1970's before the fall of the Shah of Iran and before the imposition of the trade restrictions which now forbid the importation of Persian turquoise. Hallmarked SUNSHINE REEVES and stamped Sterling inside the shank. Widest width of shank: 9/16" Width at back of shank: 3/8"